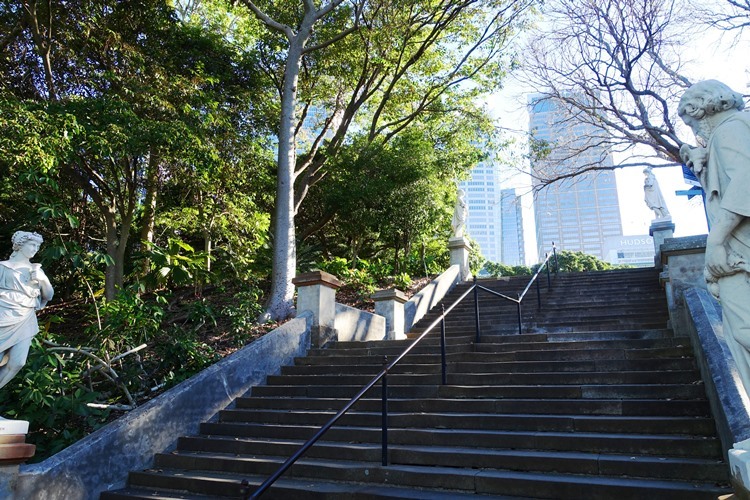 On Saturday I visited the Royal Botanic Gardens in Sydney. I not only enjoyed the wonderful flowers and trees, but also the different sculptures and statues. One set of statues that intrigued me were sculpted in marble and depicted the four seasons. The four statues are at the head and foot of a set of stairs in the gardens. The statues had originally been imported from Italy in 1883 along with four others. Today only six of the eight statues remain in the gardens. However, some of them have not been on continuous display, but have spent time in the “graveyard” before being conserved. Spring holds fresh cut roses as a symbol of the beginning of the yearly cycle. Summer carries a scythe as well as a sheaf of fresh cut lilies. Autumn is a young woman holding grapes and a goblet of wine. The four statues follow the standard allegorical theme of the four seasons which means that Winter, instead of being a young woman, is an old man. He is holding a dead bird and pine cones which represent the end of the yearly cycle of life. Which of these statues do you like best? This entry was posted in Australia, Culture, Nature, Seasons, Travel and tagged autumn, Four Seasons, Royal Botanic Gardens, Spring, Statues, Summer, Sydney, Winter. Bookmark the permalink.